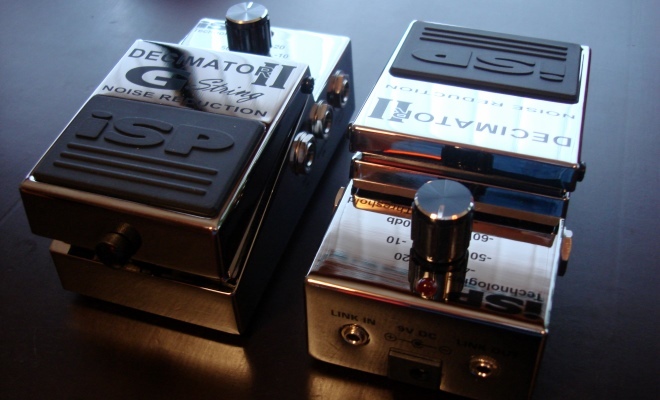 ISP Technologies introduces the Decimator II™ G String noise reduction pedal, second generation of the Decimator™ Noise reduction. The Decimator™ II G String Noise Reduction pedal was designed for those who want the ultimate performance from a noise reduction pedal. The G String Pedal tracks the signal directly from the guitar, which allows you to switch from clean to high gain without ever changing the threshold setting. The new design allows connection of the processing channel of the Decimator™ to be inserted into your effects loop or after your high gain pedals or preamp. A 1/8 phone cord is used to engage the linking function which allows you to link two Decimators™ for two channels of noise reduction. You can also use one Decimator G String II and one Decimator II pedal to create a stereo setup. This connection allows both pedals to directly track the instrument providing the tracking performance of our professional Decimator ProRack G.
The Decimator™ II G String has 4 ¼ inch jacks. Connect the guitar directly to the Guitar IN. Connect the Guitar OUT to the input of the amplifier. Connect the DEC IN to the loop send and DEC OUT to the loop return. For best performance place all gain pedals in front of the amplifier and DEC IN. You can put Delay and Reverb effects pedals after the Decimator™ II G String and before the loop return to avoid cutting off reverb and delay tails. Input Impedance: 500K ohms – Maximum Input Level: +12dbu – Effective Noise Reduction: greater than 60db – Dynamic Range: greater than 100db – Total Harmonic Distortion: .05% typical – Power consumption: 35mA @9VDC – Release response: Program dependent based on Time Vector Processing.